Established in 2011 and based in Brockholes, Holmfirth, JTD Building Supplies is a local builders merchants providing building materials and supplies to construction firms, trade customers and DIY enthusiasts, across Yorkshire. Working with some of the UK’s leading suppliers, we are able to provide our customers with the best quality products at highly competitive prices, with an efficient and friendly service. 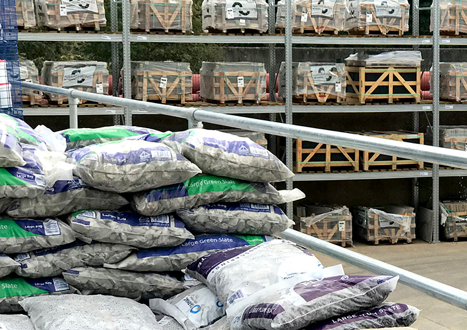 From groundworks to chimney pots and everything in between, we stock a vast range of products that can either be collected from our yard and trade counter, or delivered to your door by our HGV crane off load vehicles and a 1.5 tonne Cabstar tipper. We are a growing business that has been built on trust and experience. Whatever your requirements, we will be able to help. Furthermore, our commitment to customer service means that at JTD Building Supplies you will always buy with ease and confidence. Please don’t hesitate to get in contact with us, even if just for a spot of advice. Tony is the founder and Managing Director of JTD Building Supplies Ltd. With 33 years experience with an in-depth knowledge of the Building Merchant industry he is hands on and actively leads the business. Tony has a passion for providing an excellent Customer experience and enjoys motivating and engaging with the ever expanding team. Tony enjoys spending time with his family and also enjoys a game of golf, cycling and going to watch the football with his son. He also enjoys scuba diving and skiing whenever he gets the chance. Robert commenced employment at JTD in May 2014, and has been within the industry since 18 years of age, since starting work he has gained valuable experience at most levels, Robert currently oversees the day to day operation of JTD and firmly believes in offering a high level of customer service. Robert is passionate about the outdoors and all things Yorkshire, in his spare time with his wife enjoys low and high level walking and is a member of local walking groups, he also has an allotment and enjoys growing plants from seed. Robert has been with JTD Building Supplies Ltd since 2018 and is our Roofing Manager in charge of developing roofing sales. Robert enjoys dealing with people and making sure they leave us happy, he also enjoys the freedom we give him to make decisions. His knowledge has been gained through working in the roofing industry for over 34 years within the family business, William Smith & Sons which was acquired by SIG in 2006. He is a family man and enjoys walking and playing golf. Adam commenced employment at JTD Building Supplies 2018 and has worked in the timber & joinery industry for over 32 years, his knowledge of Timber enables him to drive our Timber offering forward. In his position within the company he enjoy's forging relationships with his customers. In his spare time he enjoys Breeding & showing Highland cattle. Rich has been with us at JTD Building Supplies Ltd since 2012 and is currently our Warehouse and Transport Supervisor, although when describing his role here he said "jack of all trades". He enjoys the fast moving and changing environment. Rich enjoys his mentor role to one of our Apprentices. He previously spent 7 years at another Builders Merchant and in his spare time loves spending time with his family, cycling, swimming and playing football with his son. Jude commenced employment at JTD Building Supplies in 2018 and has worked in the builders merchant industry since 2001 Judes current role includes looking after customers accounts , direct to site sales and working with a network of customers across Yorkshire to forge lasting relationships, In his spare time Jude enjoys travelling abroad and socialising with friends. Anthony started at JTD Building Supplies in 2016 and has worked with Builders Merchants for the last 11 years. He enjoys his role at JTD because he gets to see the beginning and the end of all work from the customer ordering to delivery of their goods. Anthony likes to socialise and enjoys travelling and watching and playing sports. Aimee has been with us since December 2018, and is one of our awesome apprentices Aimee is really enjoying the day to day learning curves of a busy Builders Merchant. She is thoroughly passionate about building friendly relationships with customers, and making sure the customer leaves with nothing but a positive experience. In her spare time, Aimee enjoys weekends away at festivals and going out with friends , she also has 2 kittens that are her pride and joy. Isaac commenced employment at JTD in January 2019 as a Trade Assistant Apprentice, He has previous retail experience in fashion and is passionate about making sure customers leave satisfied with a smile on their face. Isaac enjoys skateboarding, fashion and creating art outside of work. Sam has been with JTD on a part-time basis whilst studying at Leeds University, for the last 2 years. He is involved with JTD’s social media and helps out with general admin tasks such as invoicing. Sam enjoys the positive working environment and loves to watch and play football in his spare time. He likes a wide variety of music and is a Volunteer at KD Pro Coaching School which he has been doing for the last 4 years. We are your local independent builders merchant supplying building materials to construction firms, trade customers and DIY enthusiasts, across the Holme Valley, Huddersfield and beyond. Make sure your building is ready for all seasons with our selection of specialist materials and tools. We've got you covered with the very best in construction materials, waterproofing and bricks. Browse our wide range of landscaping materials perfect for all gardening, stonework and fencing. The high-quality finish of our selection will keep your garden in bloom for years to come. Our wide selection of roofing products is ideal for all projects, from DIY jobs to large construction projects. We have a wide range of materials and systems to proof your project. We care about health and safety and have stocked a wide selection of high-quality workwear to keep your site safe and sound. We have sourced the very best timber at affordable prices to ensure your project lasts for years to come. Materials to suit all projects, our specialist and bespoke products keep you on track and on time.